It's been a decade since the film 300 was released and almost 2500 years since the battle it depicts, but the story of the Spartans epic stand against the Wolverines, er, Persians remains as poignant today as ever. 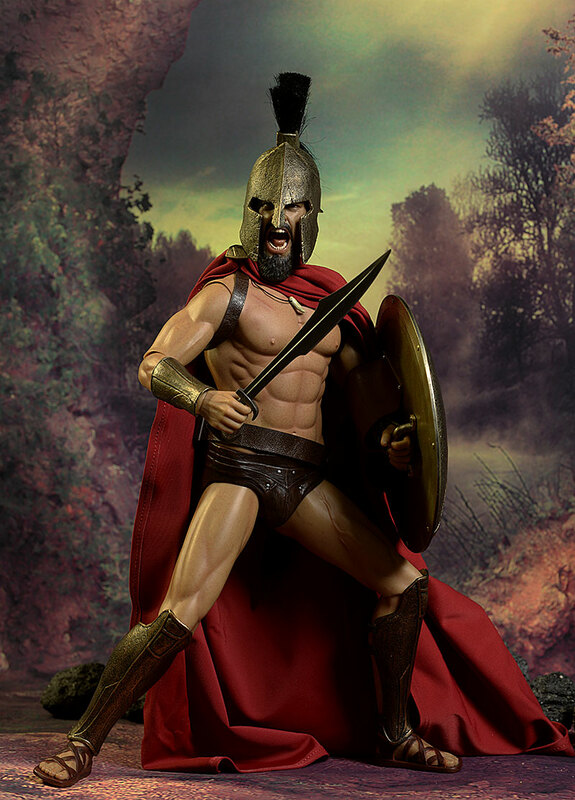 Of course, it's all about leadership, specifically the leadership of Leonidas. 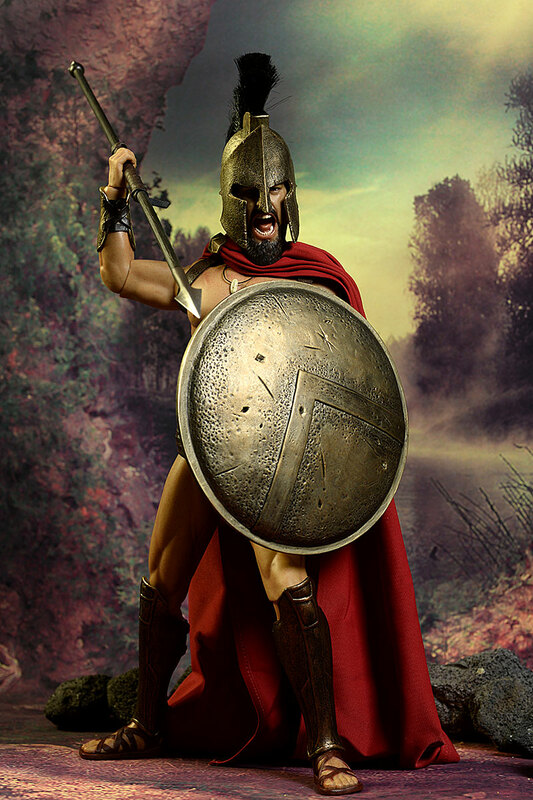 Back in 2010, Hot Toys released a sixth scale version that remains a favorite of fans, but after market prices have continued to rise. What was once a $150 figure (remember those days?) is now $600 or more. When that happens, smart companies see potential, and Star Ace is a smart company. They've just released their own sixth scale version of King Leo, but this is a bit of an early review. He should start hitting doorsteps in the next few weeks. He is running $240 at most retailers right now. The fifth panel box looks great, utilizing movie graphics and themes. They've used the mixed finish effect as well, with some graphics - like screaming Leo - in a high gloss photo finish, while the backdrop is done in a matte. It adds depth to the artwork, and is a really nice touch. Of course, it's all collector friendly inside, with most of the accessories stored in the single tray. There's an additional bag underneath with the display stand and cloak. I never bought the Hot Toys version, but I have handled it and viewed many, many photos. I'll be doing a fair amount of comparing, since that's the obvious elephant in the room. I'm going to be sacrilegious here - I never thought the portrait on the Hot Toys Leo was all that and a bag of Tzatziki flavored chips. 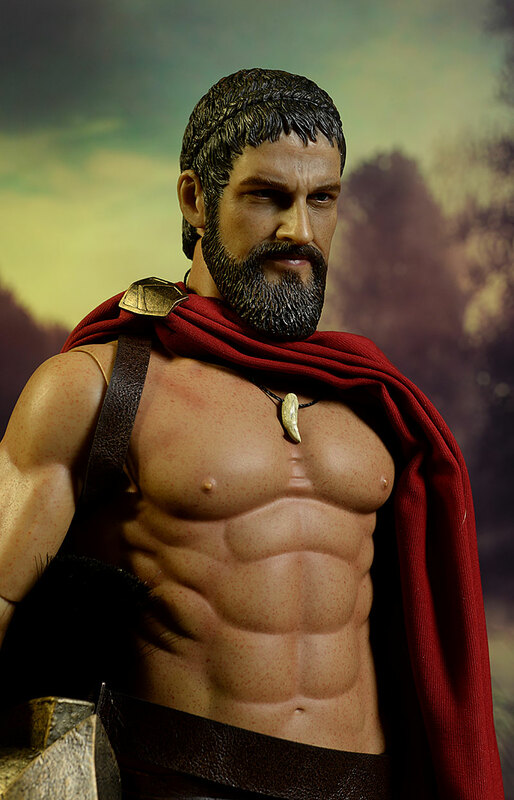 The Hot Toys release was almost 7 years ago of course, and they've come a long way, but even then they were producing sculpts like Aldo Raine when they were at the top of their game. Leo was good - life-like and realistic - but I didn't think he was particularly accurate. Sadly, I'd say the exact same thing about this Star Ace release. In terms of realism, I'd think this is on par. The hair detailing looks excellent in hand - a key improvement for Star Ace. This detail translates to the beard, which is a little shorter and rounder, and in my mind, slightly more accurate in shape. The skin texture is good, especially around the eyes, and the proportions and scale are good. The stoic expression on the standard head is fine, with enough emotion to avoid a mannequin appearance. This is one of those rare times where I actually much prefer the screaming expression the second head provides. I also like this screaming face much better than the Hot Toys version, thanks to the highly emotional expression. This version looks like he's screaming as he rushes into battle, braying at the inhumanity while he takes part in every blow. The Hot Toys screaming face looks like he's sick and tired of those whining kids, and he's going to pull the damn car over. My biggest issue is that it's not really a great Butler portrait. The screaming face is better again, but neither are quite as accurate as the Hot Toys versions, due in large part to the nose. This one is a standard male Caucasian depiction, rather than the larger, rounder nose of Butler. Like I said, the alternate head is a little better, but neither wow me with accuracy. The Hot Toys release didn't either, but it is slightly better in this regard. The biggest overall difference between this figure and the Hot Toys release involves the shoulder, knee, and elbow joints. Here they are visible, although the are designed to be slightly less obtrusive than a standard sixth scale joint. On the Hot Toys version, they were covered by rubbery skin. Star Ace did use a skin covering over the chest and waist joints (they are there), but it's not rubbery. Instead it's the slightly stiffer feeling plastic that current companies claim will have a longer shelf life. These exposed joints are likely to be the number one deciding factor for most collectors. Either you hate them or you don't, and that's a very personal decision. I'm not a big fan of the covered joints, particularly the elbows and knees, because of the way the skin puckers weirdly with any sort of bend. I find that more unnatural looking than the exposed joint, but your mileage may vary. 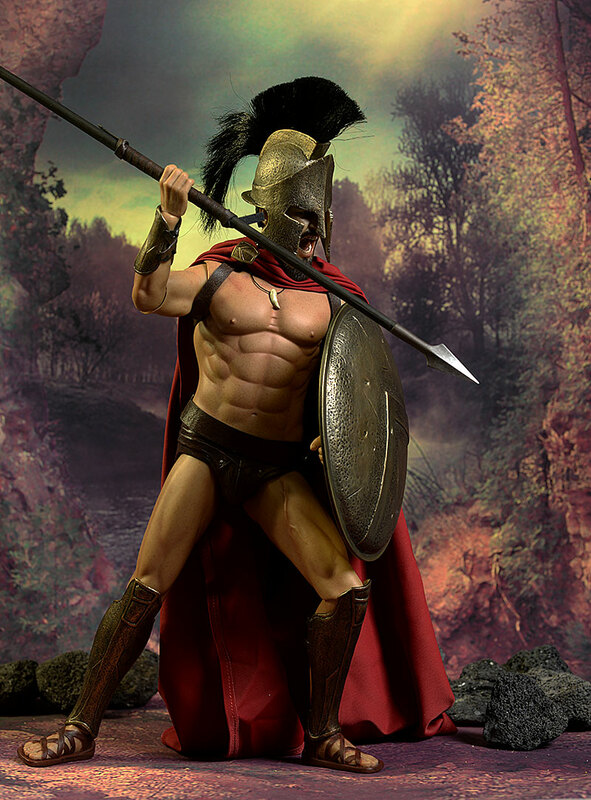 One other area of concern is the sculpted abdomen muscles. I'm not a student of the human physique...at least not the male physique. To my untrained, uncouth eye, the physiology looks just fine. But I do know that some of my artist friends take issue with the size and shape of some of the muscles, and even I have a problem with the mechanical look of the little indents between his pecs. This guy stands just north of 12" tall, and should fit in pretty well with the rest of your 1/6th display. Let's start with an obvious effect - the mottling of the skin from the neck down. This freckling is over all the exposed skin - neck, torso, legs, arms. In macro photos, it's obvious, and it might look odd. However, in hand it provides an extremely valuable effect. 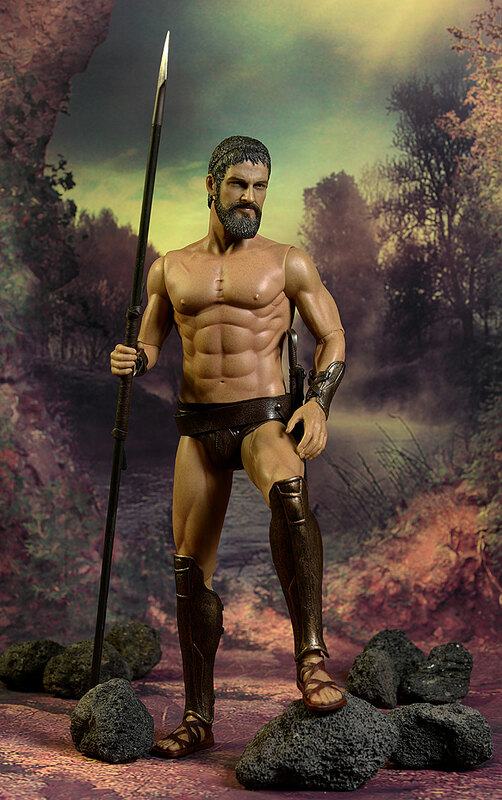 No human has the perfect, unblemished skin of a plastic action figure body. Even if you ignore the subtle marks, freckles, moles, and scars of life, you get variation due to texture, coloration, and wrinkling. What Star Ace is attempting to do with this speckled paint job is create a more realistic skin tone in hand. And in hand, where your poor eyes can't pick up on every tiny dot, it looks good. I think they still have a way to go to perfect it, but I think they are on the right track. Figures with large expanses of exposed skin need something to create a more realistic look - this is a step in the right direction. The paint work on both head sculpts is quite good as well. The skin tone is a little darker here than on the body - not surprising - and the subtle transition between the beard and skin looks great. The eyes are sharp and clean, and the work on the skin around the eyes is very realistic in tone and color. Perhaps the best feature of all is the tremendously realistic tongue, clearly visible in the wide mouth. There's a thickness to the gloss coat that adds depth and a slightly translucent effect, and the slight variation in color is just about perfect. I do have a couple nits, of course. On the standard head, the lips are simply too dark. I think Leo is really more of an autumn. On the screaming head, the teeth are a bit too gloppy. It might be a softer sculpt on the teeth, but I don't think so - I think it's a slightly thick paint application causing the issue. Still, the work on both heads shows improvement for Star Ace. One of the greatest weaknesses of the Hot Toys figure was also one of the greatest selling points - the skin covered joints. They reduce the articulation while improving the look, but because of fears of damage and degradation over time, most collectors end up displaying the figure in a very static manner. Without the covering on the arms and legs, you get the opposite effect. There should be no worries about holding poses long term, including those with the hands raised high above the head. But the joints are visible, making the arms and legs less attractive. The ball neck joint works great, with plenty of tilt and lean movement. The head and neck are all one piece, but the lower neck joint makes up for it in abundance. The uncovered shoulders are rotating hinge joints, and can allow the arms to raise above the head. While the joint is visible, it can be hidden somewhat by the pleather straps on the chest. More on that in the Outfit section. The elbows are hinge joints as well, but there's not much rotation here due to the design. They can turn slightly, but most of the in and out movement on the arms will come from the shoulders. The wrists are standard stuff, and the hands swap relatively easily. There aren't any extra wrist pegs, but I wasn't overtly worried about breakage while working with the hands. The ball hips allow for a good range of movement, but can create a large gap between the leg and codpiece. That's simply the nature of a deep stance. The knees and ankles aren't covered either, but the greaves and sandals make these joints less visible anyway. While they are visible from certain angles, it's not a major decision factor. Finally, the waist can turn *slightly*, and there's an ab-crunch hidden under the plastic skin. Neither will do a lot, but they are there. Overall, you should be able to get some very active, dynamic fighting poses, and you won't have to worry about long term damage. 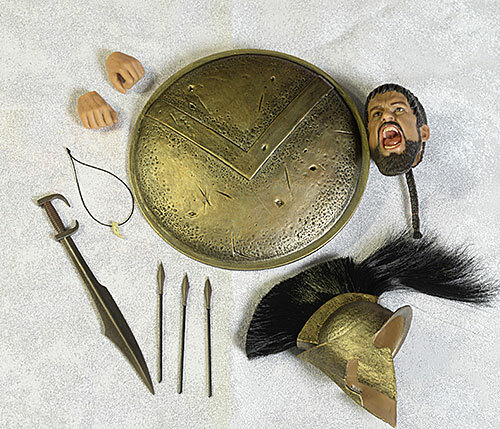 The quantity and quality of the accessories are quite similar to the older Hot Toys release. As I've mentioned several times, there's a second screaming portrait. The heads pop on and off easily, but take care with the pony tail in back. There's only one set of extra hands, making two sets in total. He comes wearing a relaxed pair, and you can swap to a gripping pair that work well with the accessories. Swapping is relatively easy, and the hands stay in place once on. 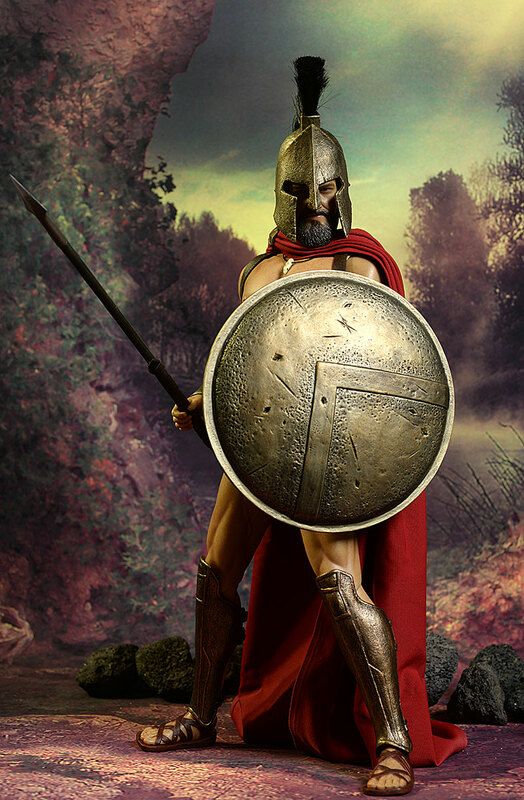 To protect himself, he has his large shield as well as his helmet with the bushy crest. These are done in a fairly dark hammered bronze color, looking quite burnished and realistic. The helm is made from a moderately soft plastic, and the guards on either side of the jaw are pushed out a bit too far on mine. The softer plastic means that you should be able to heat them up a bit with a hair dryer, hold them in place closer to his face til they cool, and get just the look you want. The helmet fits great on the head, and the eyes and nose line up perfectly. The shield looks great, but getting him to hold it can be quite the trick. There's a leather sleeve and plastic handle on the back side. The arm goes through the sleeve, and he grips the handle. Seems easy, but it's not. The instructions advise putting the hand on the handle first, then slipping the arm through the sleeve and pressing the hand onto the wrist post. I tried this, but found it difficult to work with the odd angles. If you do go this route, definitely head up the hand first to make popping it on the wrist even easier, and be careful putting too much pressure on the sleeve. I got lucky - the handle popped off when I was working with it. The posts holding the handle on the shield are quite long, and popping it back on was no problem. That meant I could put the hand and arm through the sleeve, put the handle in the hand, then snap it back in place. I don't recommend trying to force the handle off - it's supposed to be glued - but if yours pops loose it can be an advantage. To go along with the shield, there are three broken arrows. These can attach to the front of the shield, although it's a little tricky to do. I think they should have designed it a little better, but it does work. One or two full arrows would have looked great too, but the broken versions are all you get. He can wear the tooth necklace around his neck, which is a nice touch, and the belt and scabbard for the sword are easy to work with and look good. The sword itself has a decent sculpt and paint job, and because it's made of plastic, is quite light and easy to hold even in dynamic stances. The last weapon is the large spear. With an actual wrapping on the handle and very sharp tips, it looks great in just about any pose. 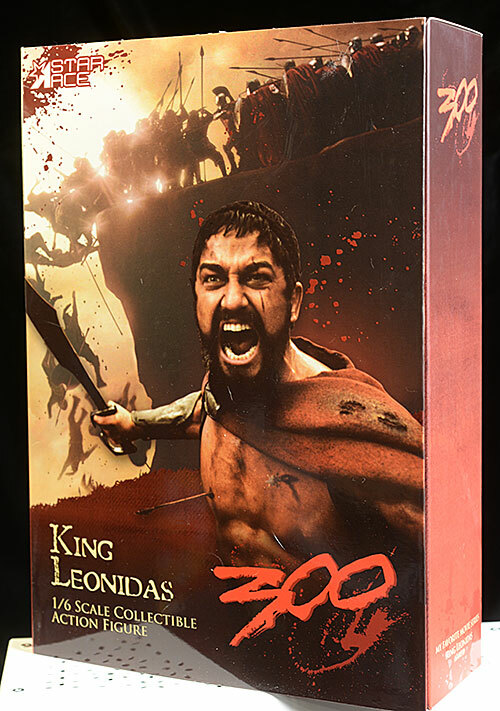 Finally, he has a basic crotch support display stand with the 300 logo emblazoned on the base. While Leo is half nekkid, there's also several key aspects to his outfit that are worth calling out in their own category. I've talked somewhat about the armor. 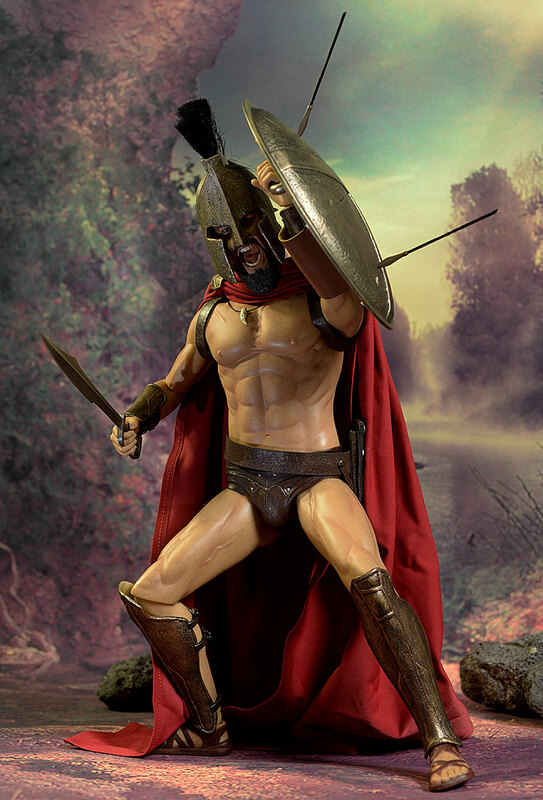 The greaves, gauntlets, codpiece, and sandals look very realistic, with great sculpting on the textures and details. The cod piece looks leathery - the greaves look metal. They've captured everything in a realistic way, even if it is all plastic. I also really like the color of the bronze, burnished pieces. 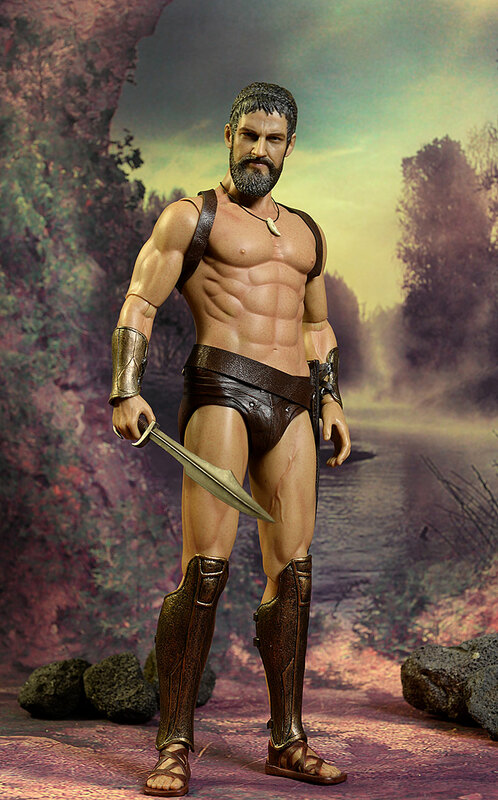 The darker color works well, and lends an air of 'bronze age' to the character. And yes, I realize the Bronze Age had ended by this time, but I'm not trying to be literal - the look just suits the character. Another aspect of the character is the pleather back/chest piece. This contraption includes two straps that go around the shoulders and attach in back via a buckle. It works fine, but the fit is a bit wonky. It helps hide the shoulder joints, but it also tends to ride up tightly into the joint, and I worry that over time it will wear and break. Last but not least is his cape. Not only is it not least, it's best. I love the heavy material, which hangs with serious effect. It can go over both shoulders, although he tended to wear it with the clasp to one side, covering the left shoulder more predominately. The dark red looks good, and while it comes out of the box a bit wrinkled, it's nothing a little steam can't fix. The top of the cloak is pleated, and I do think those pleats need some work to get them to lay flatter. This is a case where a water treatment might help, and you can flatten the pleats while the cloak is wet. Upon drying, I think it will lay slightly better. Plenty of posing with little fear, and some solid accessories to give him multiple looks on the shelf. That means you'll pose and re-pose without a care, always a big factor in improving the 'fun'. Is Star Ace at the point where $240 is an appropriate price? I'm not quite feeling it yet. I mentioned the issues with getting the shield in place - take care and be patient. The arrows don't stick in the small holes all that well either, and you should avoid trying to force them. Other than that, you should be good to go! This is solid work from Star Ace, if not their best. It's a character definitely in demand, and this is an excellent alternative to the extreme prices of the Hot Toys release on the secondary market. I have my issues - don't I always? The sculpt, while life-like and realistic, lacks in accuracy. The screaming head, particularly in the helmet, is the route I'll be taking. I can take that route thanks to the articulation, and with no rubbery skin, Leo can take a great action pose and stay there on the shelf long term. The torso sculpt (in terms of physiology) is a little weird, and I wish some of the more minor issues (like the arrows sticking easier in the shield, or the pleats laying a bit flatter on the shoulder, or even the helmet fitting a bit tighter along the jaw) were corrected. Much of this can be corrected by the buyer, but the mark of a great figure is one where none of that is necessary. 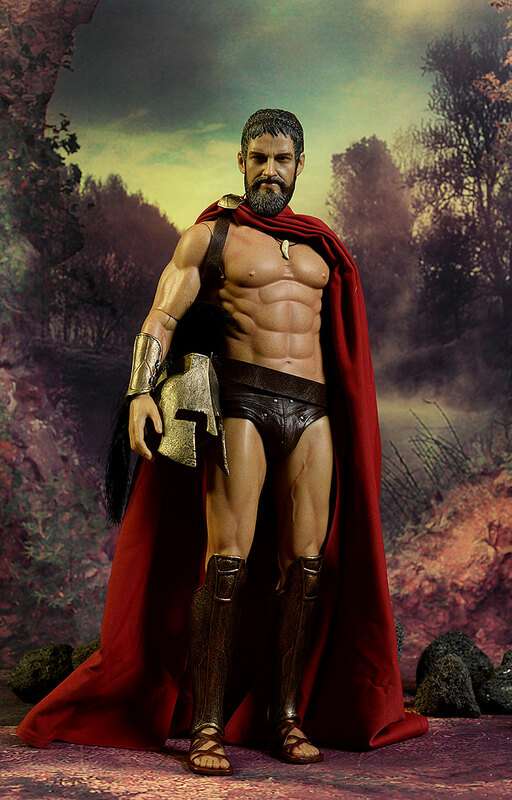 Still, if given the choice of the Hot Toys version or this one, I'd actually go with this one - gasp! While the Hot Toys sculpt is more accurate, it's still not at the level we know they can produce, and I prefer the expression on the Star Ace screaming head. I also prefer the Star Ace cape, and the exposed joints aren't an issue. My biggest problem is the price point, which is $20 - $40 over what I think it should be. Of course, that's without knowing either the production size or the license cost, but the perception of value is one that every company must grapple with. - comes in at $240. - has the pre-order at $240. - also has the pre-order for $240. - Sideshow has him at the same $240. I never picked up the Hot Toys version, but I do have a terrific guest review from Jeff Parker. 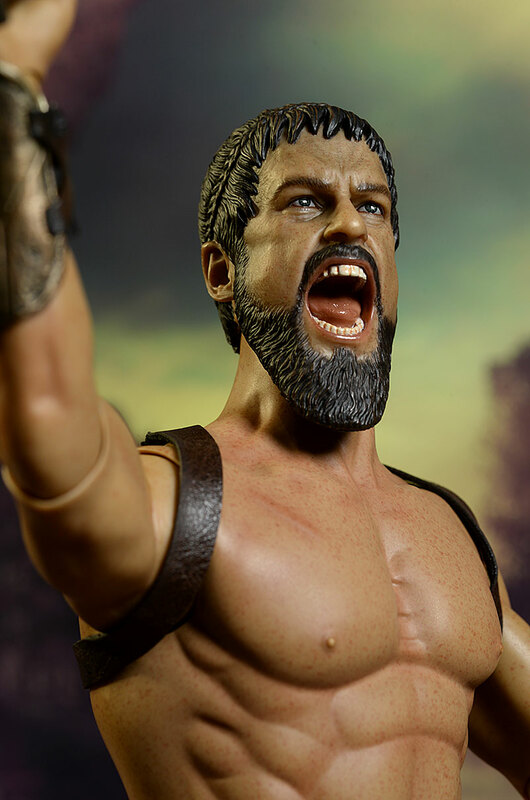 NECA did a smaller scale wave of Leonidas and Gorgo, if you're looking for something to go better with your other 7" figures.